The Perfect Grind Technology and power of 1,000 W will make milk really thick and dense. This milk maker is optimized for making milk from beans, grains, seeds or their combinations. The stainless sieve has a small volume. If you want to diversify your menu with healthy and nutritious meals, this fully automatic soy milk maker is a must-have. The milk and other vegetable juices and drinks are just wonderful. If it is in your kitchen, your diet becomes more healthy and cholesterol-free. The Patented 3D Heating System ensures fast heating of the entire body and you can make the test run of the device immediately using 0.3 pounds of bonus soy beans. The white body gets stained quickly and requires delicate washing and cleaning. This stylish model will decorate any kitchen. Its Double-Thickness feature makes the milk actually thick and dense. Such milk is a perfect ingredient for making famous tofu cheese loved both by children and adults. 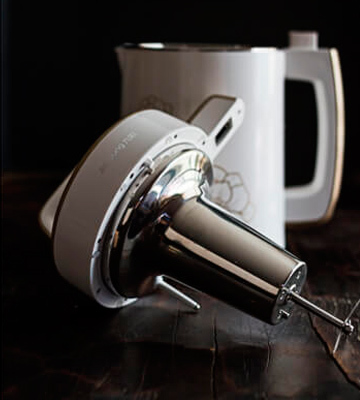 The unique design and Helical grinding blade allow utilizing this device not only to make the soy milk but even to grind coffee beans. Availability of only two cooking functions demands certain practice to cook soups. 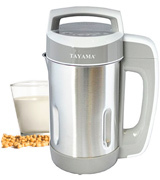 Despite the fact that this device serves primarily to make soy milk, it may also substitute a kitchen blender. It can grind and blend any ingredients. 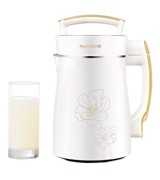 Tribest Soymilk Maker will become your indispensable assistant. The double layer chamber keeps dishes hot for a long time and protects you from burns if you touch it. After using the auto clean function, you might also have to clean the blade manually. 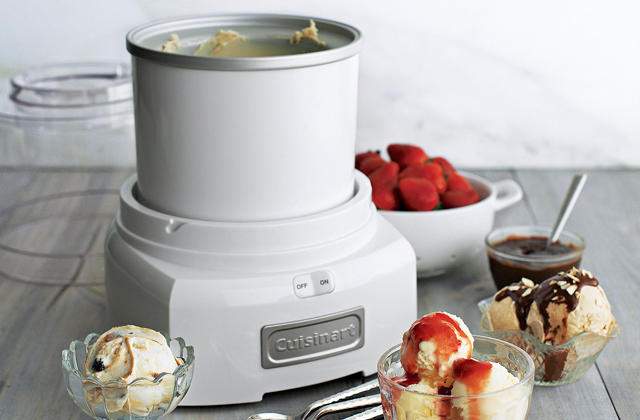 It is the highest capacity machine of its kind, which allows cooking over a half gallon milk at once. 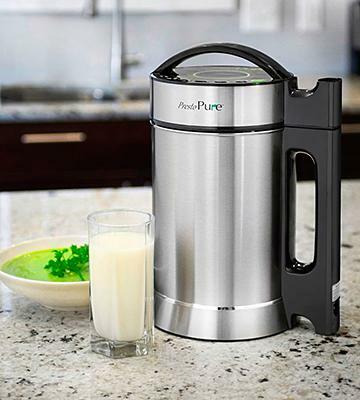 Moreover, the Presto Pure Milk Machine will introduce you to delicious freshly-squeezed juice, cream soups, and oatmeals. The Congee function grinds beans thoroughly and makes the drink more fragrant and nutrients more concentrated. Due to the single-layer body, the milk maker gets very hot in the process of cooking. 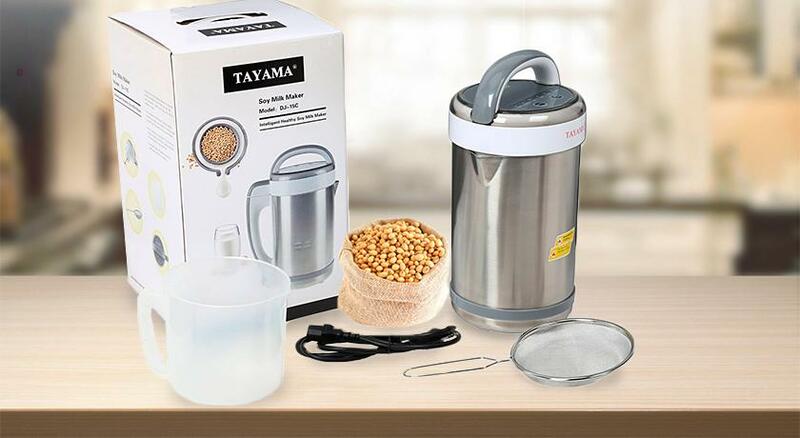 In a short time and with minimum efforts, the device proposed by Tayama will prepare for you fresh and fragrant soy milk, paste, soup, and much more. 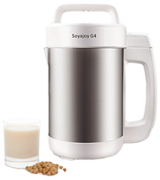 The SoyaJoy Milk Maker prepares milk that is not worse than cow’s milk in terms of protein content. Having it in your house, you should only keep soybeans in a sufficient amount. Let’s take an intelligent look at this superb device from Sanlinx Inc. 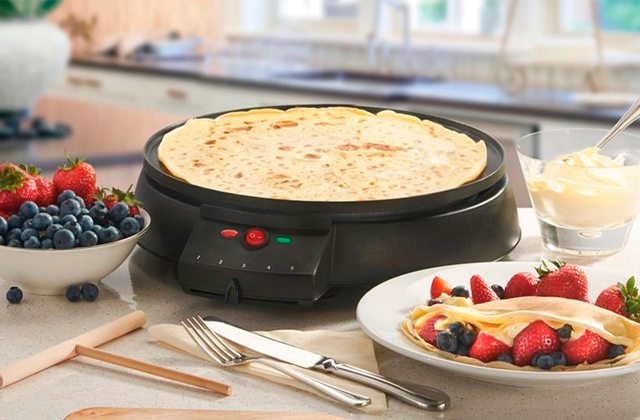 This model features a bottom heating technology that quickly and evenly cooks meals and leaves no strange taste. 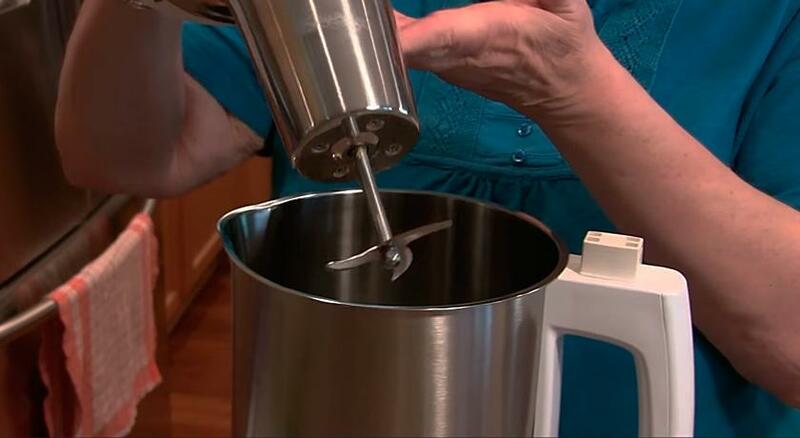 You may simply put all ingredients into the stainless steel cup and the mixer blade will easily grind them. The blade is also made of stainless steel and it will remain sharp for its whole life. The patented Perfect Grind Technology™ guarantees high milk yield, assuring its rich flavor. The cup capacity is 1.7 liters, i.e. the volume of ready-to-drink milk should be approximately 1.6 liters. 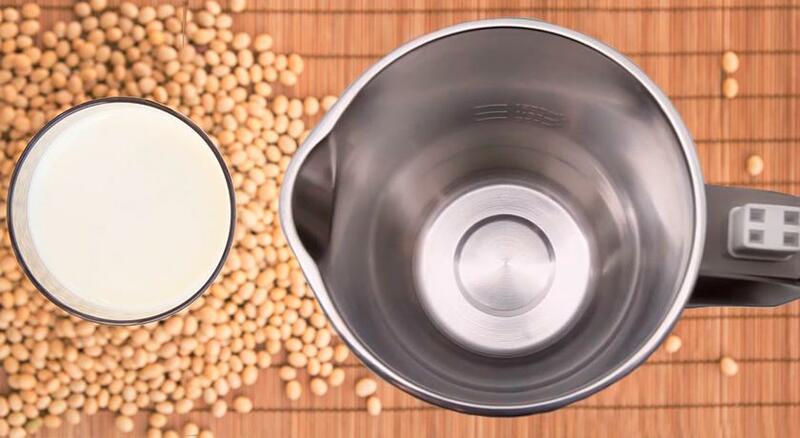 5 pre-set functions allow you to easily cook soymilk not only from soaked beans but also from fresh ones. Besides, you can quickly make porridge or squeeze some fresh juice. This milk maker has a power of 1,000 W, which is good enough for grinding any kind of beans or nuts. 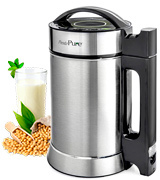 It is not difficult to prepare almond milk with the help of this particular model. Soymilk is cooked within 20 minutes at above 200°F. For the maximum control over the cooking process and its safety, this soymilk maker is equipped with a processor and diverse sensors, making the process fully automated. The special sensor controls the level of water in the cup. The pitcher has necessary marks simplifying the volume measurement. 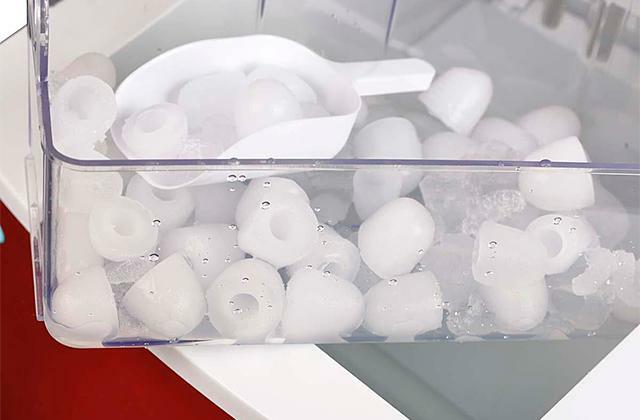 The overflow sensor prevents milk from spilling and the temperature sensor will maintain the heating temperature above 200°F for best nutrition and taste. Finally, the manufacturer will surprise you with the extensive choice of included accessories: a measuring cup for solid ingredients, a cleaning pad for easy maintenance and a stainless sieve for filtering liquids. We also recommend purchasing soybeans in bulk and discover many new wonderful dishes. We strongly recommend you to buy Laura Soybeans By Sanlinx and discover the whole bunch of scrumptious dishes. It is important that there is a "Non-GMO" sign on the packaging evidencing the product ecological properties. The machine is very easy to use and you'll have hot soymilk in about 30 mins (excluding the soaking time, which we do overnight). 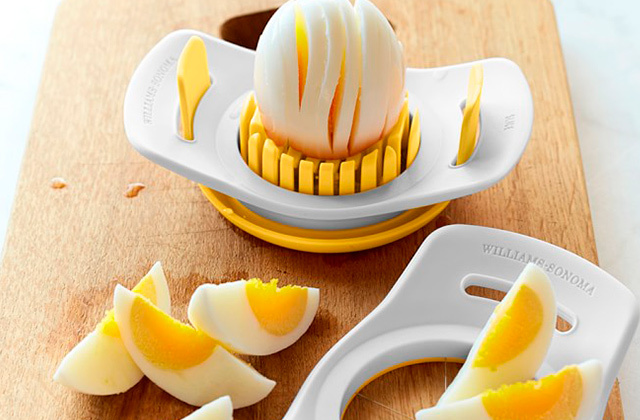 The things I looked for was: multi-functionality, durability, easy to clean, looks nice, the right size for our family of three, and not complicated to use. I like my soy milk really thick so I tripled the amount of soaked beans, use max amount of liquid, and run the "soaked beans" function twice and let the machine keep warm twice to get as much flavor out of the beans. This made it super delicious! The only problem I've encountered is that the cord does not fit snugly into the base of the appliance and because of that, the appliance loses power and stops in the middle of a cycle. So a couple of times I have had to restart the batch. Do you believe that beans can be turned into ready-to-drink milk within 20 minutes? According to the people who have tried cooking soymilk without special devices, it’s impossible. But they change their mind after trying this particular soymilk maker. We assure you that the process of grinding and heating will not last longer than the mentioned limits. Consequently, you will not wait much before enjoying freshly cooked soya milk. Apart from high performance, this model has an attractive design and will decorate any kitchen. 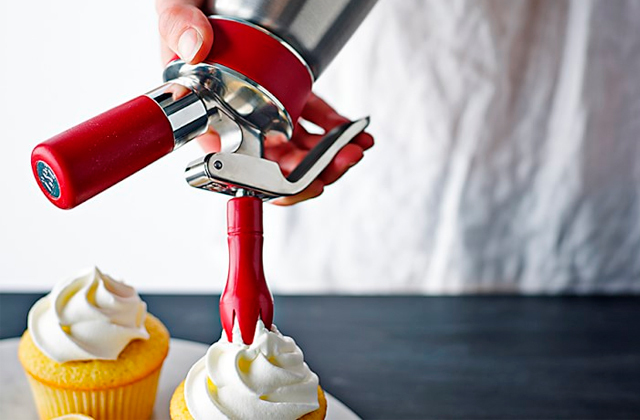 The cup and grinder that come in touch with food and liquids are made of stainless steel. The device uses a new 3D heating system without a heating tube. Instead, the system applies heat to the entire body for even cooking. The cup has no filters for efficient grinding and simple cleaning. The cup capacity is 1.37 liters, which is sufficient for a family of 2 – 3 persons wishing to savor nourishing and healthy food. 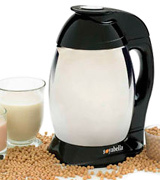 This milk maker allows cooking soymilk from wet or dry beans. But if you soak beans in cold water for a couple of hours, the taste will become more delicate and delightful. The power of 900 W and 6 cooking functions make it possible to enjoy such good and healthy dishes as rice paste, porridge, various juices, and jams. Soybeans belong to the most ancient crops cultivated by humans; they have been grown for more than 5,000 years. This fact is confirmed by drawings of soya plants on stones, rocks and tortoise shells found in China. The first tests of soybeans in the USA were organized in 1804 in Pennsylvania and later in 1829 in Massachusetts. In the 1890s the majority of test farms held diverse experiments with soybeans and studied its useful features in detail. Thanks to the high protein content and a beneficial effect on the human body, in 1898 the US imported a lot of various types of soybeans from Asia and Europe. This was the onset of industrial cultivation of this plant in the US. 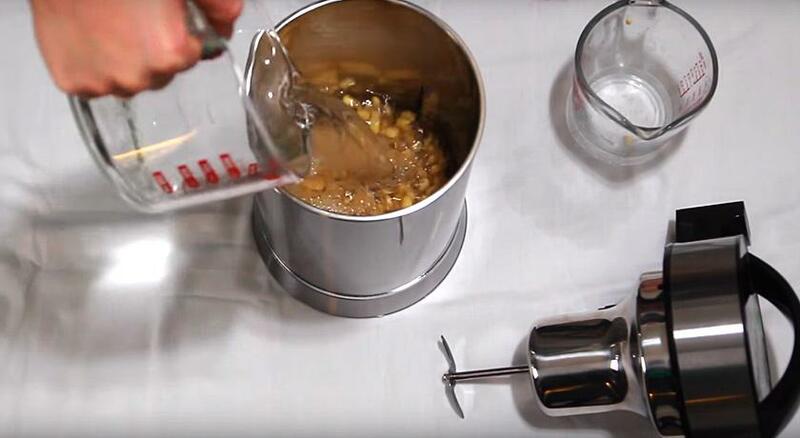 This device not only makes tasty soymilk but also cleans itself. You only have to pour water into the cup and press the ‘Easy Washing’ button - the milk maker will be cleaned from food remains. The Joyoung Milk Maker also features a special function Double Thick, which increases the mixing intensity and makes milk thicker and denser. The LED Status Indicator reflects the current stage of the cooking process. The set includes a metal strainer that separates the cooked milk from okara and a plastic pitcher for pouring milk and storing it in the fridge. To make a perfect tofu you need a coagulant. We offer you to check on Gourmet Tofu Coagulant. This 100-g pack will be enough. The normal cycle (soaked beans) takes about 20 minutes to complete. Very convenient. Easy use. Sometimes, I forgot to have the soy bean soaked before night. You can still have a soy milk instantely. Well, if you soak the soy bean, that's better taste. Multiple modes for selection and is one-button press and worry-free. I am So happy about the purchase. Of cause it does good job on making the soybean milk. It is also very easy to clean ( this is a big deal for me) and it looks great in my kitchen (I don't have to hide it ). Unlike the previously mentioned devices, all ingredients are placed into a special screen attached to the upper part of the cooking chamber instead of a cup. This design allows better grinding and separating okara from milk during the cooking process. You may be surprised but okara can also be used in cookery. This product is rich in protein and cellulose, yet it’s ‘poor’ in calories (which is appreciated by vegetarians). Okara may become a basis for sauces or an additive to pastry, or it may be used to bake biscuits or cookies. In other words, you can try whatever recipes you want and enrich your diet with tasty and healthy meals. As in the majority of modern soymilk makers, the heating element is at the bottom of the stainless-steel cooking chamber. The 1.7-liter capacity of the cup suffices to prepare enough milk for a couple of days. Despite the fact that this device features only 2 functions (Soy Milk and Paste), you can easily cook milk from beans, cereals, and nuts. Moreover, you can make pureed soups, porridges, creams, and sauces. The only difference between the functions is the grinding speed, so you should only choose the desired dish and it will be ready in 15 minutes. The installed sensors protect milk and other dishes from overheating and overflowing. There is also an internal security system preventing the switching-on of the device if the cup is empty or the screen hasn't been fixed securely. The set of accessories is amazing! 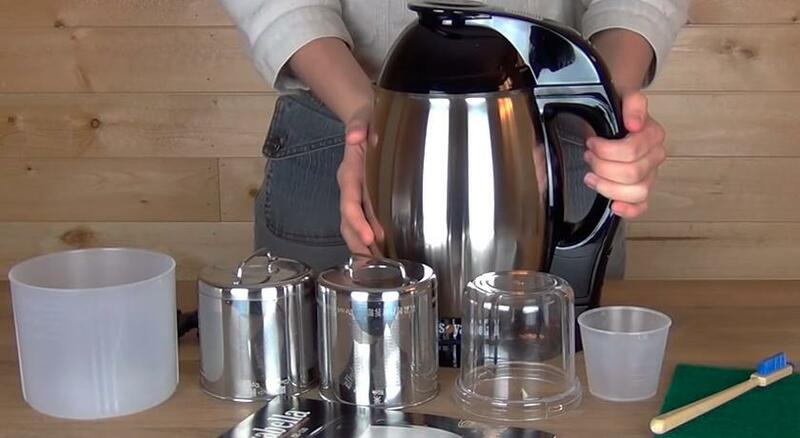 It includes filters for milk and soy paste, a grinding cup for nuts and coffee beans, utility and measuring cups for measuring and soaking the exact amount of beans. There are also a cleaning brush and a pad for cleaning the device. 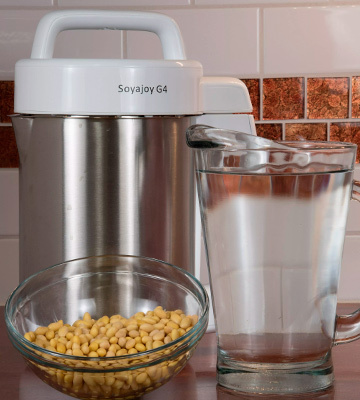 The information manual includes recipes of healthy and nourishing meals that you can easily prepare with this soymilk maker. It is an elegant and affordable unit, which will make your diet varying and exciting. The power of 750 W and a special Helical grinding blade allow crushing any beans, nuts, and even coffee beans. It is a great advantage since it turns the milk maker into the coffee grinder at your wish. A cup of freshly ground coffee has a savory taste and rich aroma. You may learn more about coffee if you read our review on best espresso machines. To store your delicious soy milk in the fridge, try an amazing Bormioli Rocco Gelo 2-Piece Glass Pitcher Set. Two pitchers come with lids in different colors and will be of great use in your kitchen. Presto Pure IAE15: 30 min. It's a very well built unit with an appropriate design. It comes with full instructions and all the necessary accessories and it's extremely easy to use. 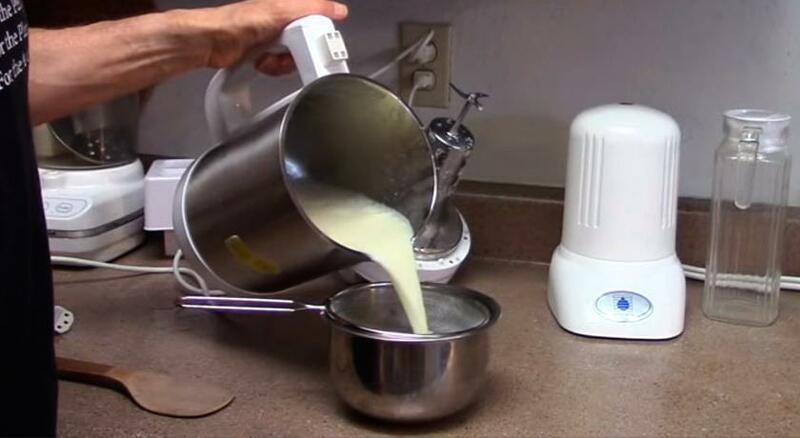 Easy to use, simple to clean, and makes a full pot of milk with just one cup of nuts or seeds. I've used it to make almond, cashew, and pumpkin seed milk and all turned out great. It comes with full instructions and all the necessary accessories and it's extremely easy to use. As well, when it arrived we had to spend even more money to purchase an adaptor as it was made for US power points. The Presto Pure IAE15 has a double-layer stainless steel cup ensuring both fast and reliable heating, and keeping the temperature for a long time. The heating element is hidden inside the bottom. The capacity of the cup is amazing and amounts to almost 2 liters. Because of the large volume, cooking of soymilk takes approximately 30 minutes, which is a relatively good time, considering the power of 800 W. Besides, soymilk can be used as a basic ingredient for other healthy meals, such as baked goods and a unique tofu-cheese (popular in Japan). You try it once and you will surely like it. Soymilk can be kept at a room temperature for 6 hours at maximum, but it will not go bad for 2 – 3 days in a refrigerator. The leadership in soya cultivation belongs to the USA, Brazil, and Argentina. For example, in 2005 the global soybeans output amounted to 91 million US tons (82 million European tons). 2/3 of US exports is bound for China. Soy diet leads to the weight loss and body slimming. Soybeans contain lecithin necessary for metabolism and fat burning. Soybeans are a perfect source of protein. The protein content of soy makes approximately 40%. The protein in soybeans is almost as good as the protein in meat. An inquisitive eye will notice 7 functional buttons on top of the device with names of specific functions and dishes. The Dry and Wet Bean/Nut modes allow cooking milk from dry or soaked beans; other modes are for preparing cereals, porridge, rice paste, pureed soups and juice from fruit and vegetables. You may even prepare a corn juice if you like. 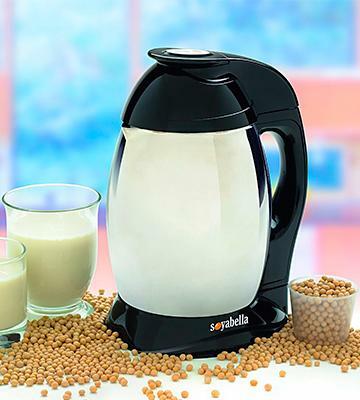 All features of this soymilk maker are designed particularly to minimize your personal involvement in the cooking process. The process is fully automated. The special sensors control the accuracy of the mix of soybeans and water assure the best taste of your meal. The overflow sensor prevents milk overflowing and the 'Clean' function allows cleaning the cup quickly. To activate any of these functions you should only press an appropriate button. The set includes a pitcher and a filter with a sieve for separating okara from milk. To clean the blade from food remnants, you can use a scrubbing pad and a cleaning brush (included in the package). Ingredients are measured by means of the measuring cup and various recipes might be found in a special manual. A healthy and nourishing diet has never been so simple! 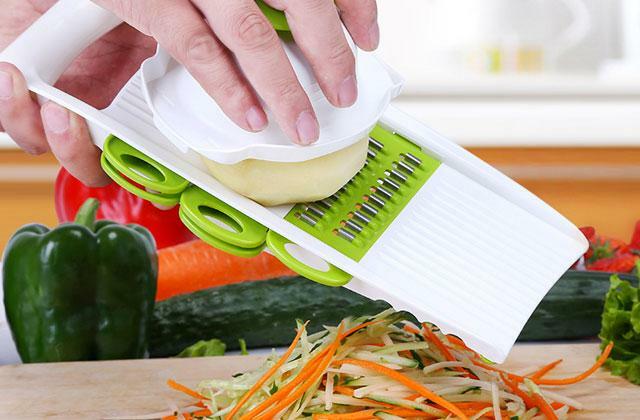 We also advise you to purchase a special set for preparing classic tofu-cheese Gourmet Tofu Press. It will easily remove the moisture preserving its taste and flavor. Sturdy dual stainless steel wall construction also provides some insulation. Exterior is easy to keep clean. FYI, expect some operational noise as with any other appliances with a motor. I was going to say that it might be a con that you have to remember to soak the beans overnight, but there's a dry bean option too. I haven't tried that yet so I'm not sure how different the milk tastes using that function. I use this machine at least twice a week! It makes the best soymilk, almond milk and hemp milk in only 30 minutes. I highly recommend this to anyone looking to eliminate all the thickeners, stabilizers and unnecessary sweeteners present in commercial varieties. 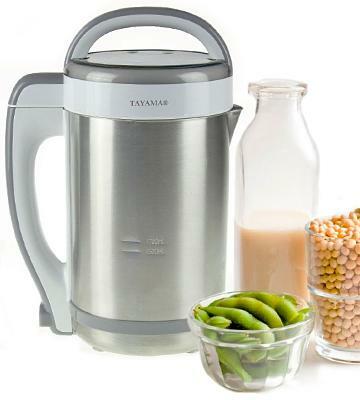 The manufacturer Tayama is well-known for its unique multifunctional kitchen appliances. This Soy Milk Maker is not an exception. The results of tests have proven that the body is ergonomic, the heating element is hidden inside the bottom and the blade and cup are made of durable and environmentally safe stainless steel. These features ensure a great durability of the device. The relatively large volume of the cup (1.5 liters) allows making up to 1.4 liters of filtered soymilk separated from okara. Be sure that the product you get is ecological, healthy, and free of preservatives (unlike some samples of milk that may be found on supermarket shelves here and there). What About Some Healthy Broth? Looks like we have already listed all possible functions of soymilk makers. But this device has certain features, which may pleasantly surprise you. It has 6 functions for cooking milk from beans and nuts, rice paste, pureed soups, juices, and congees. A congee is a broth saturated with juice of ingredients boiled in it. Congees, broths, and potions are commonly used in diets and in folk (non-traditional) medicine. 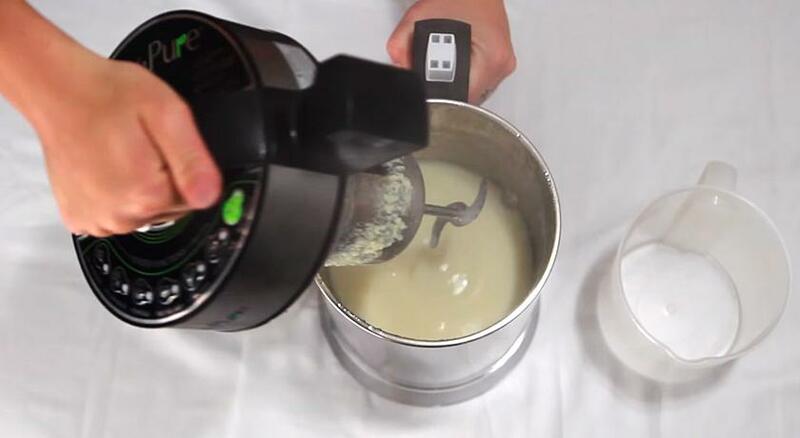 The average duration of cooking soymilk and other meals is approximately 20 minutes; the whole process includes heating water and grinding ingredients at a time. You should only put everything into the cup, pour water and press the button. The milk maker will do the rest. And you will enjoy your meal afterwards. 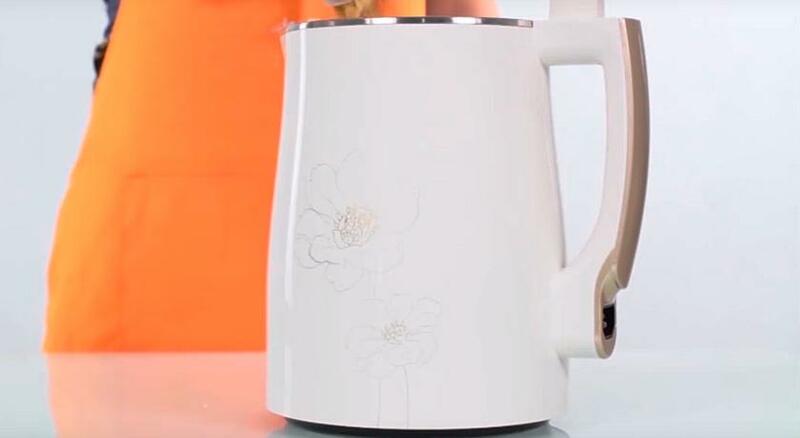 As well as other similar devices, this soy milk maker has an overflow sensor and a dry-cooking protection. A temperature control sensor maintains the set temperature during the process of milk making. 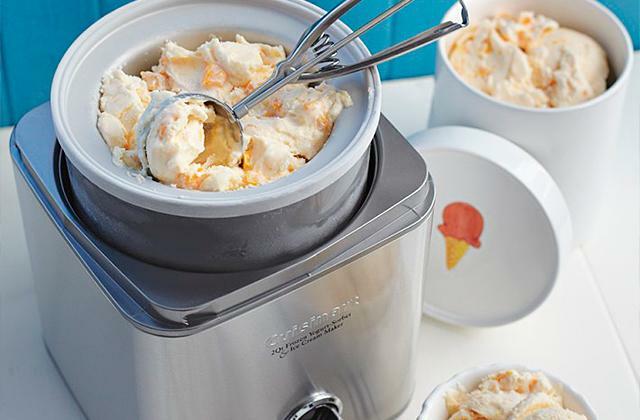 Accessories also include a measuring cup for ingredients, a metal strainer, and a pitcher. A cloth filter can be used instead of a steel sieve to streamline the separation process if you wish to. To make utilization of the device even more comfortable and convenient, the set of accessories includes a cleaning pad. And remember: drinking soymilk instead of cow milk ensures you will be healthy and feel well! As an alternative to a steel sieve, you can use a cloth filter that will streamline okara separation process. And we would like to recommend you to consider Pro Quality Nut Milk Bag as well. This capacious bag filter will efficiently separate okara that you can use for cooking some other healthy dishes. Presto Pure IAE15: 6 lbs. Machine works great takes about 20 minutes to make a small batch of soy milk. Each batch you make makes roughly 5.5 cups. It was nice to be able to plug this in and use it with no trouble. Many others are 220v and I had to get a transformer to run it, this solved that problem. Product it self, which is the most important part, is GREAT! The package has two scrabbles for after-use cleaning and has a filter which you can use to filter out the skins of fruits or soybean which makes your milk finer. My wife absolutely loves this soy milk maker. Top quality and does the job. Soymilk is a product originating from Asia that has quickly become widely consumed throughout the world because of its multiple advantages. It should be noticed, that soymilk is rich in protein, fiber, vitamins B and E, and many other healthy elements. In contrast to the cow milk, it can be safely drunk by persons allergic to lactose, vegans and those on a special diet. But cooking soymilk with improvised tools may be rather tedious: beans should be ground, then cooked on a small fire and periodically stirred. 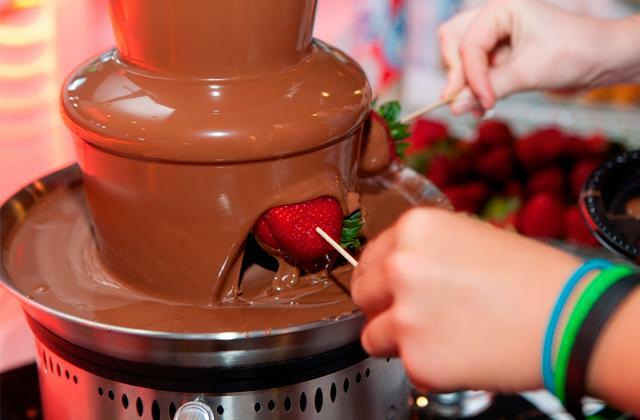 It is also necessary to be careful and to avoid any sintering or burning of milk. The Soy Milk Makers were designed exactly for these purposes: they can cook ready-to-drink milk with almost no effort. 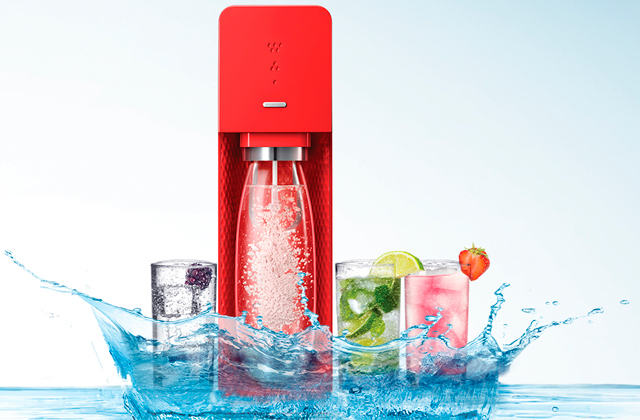 They are automated devices making food without user’s participation, leaving you only to take pleasure of the marvelous, tasty and nourishing natural drink. Discover the soymilk for yourself and it will become an integral part of your daily menu. 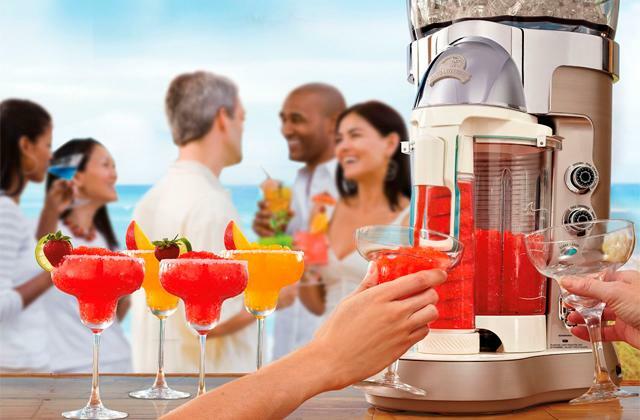 The lovers of healthy foods may also be interested in our review on juicers for making natural fruit and vegetable juices, and hand blenders, which allow an easy cooking of various diet pureed soups, etc. Firstly, you should consider Design of Soy Milk Makers. They all differ in heating elements that directly deal with milk making. 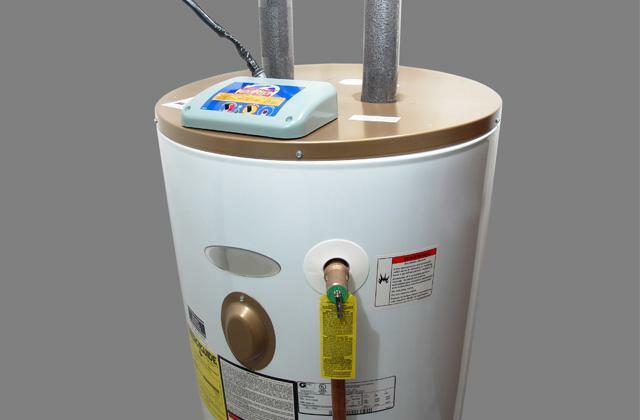 Today, manufacturers install open heating coils or heaters hidden inside the bottom or walls of the cooking cup or chamber. The open coil directly contacts with a meal, so its drawback is a possible undesired side-taste and time- and effort-extensive cleaning process. The heaters inside the bottom or walls protect meals from burning and are much easier and convenient for cleaning and washing. The cup is usually made of plastic or stainless steel. Plastic cups can be transparent, allowing you to supervise a cooking process. Yet, stainless steel cups are more durable and functional; the majority of modern devices are equipped with cups and chambers made of stainless steel. The only negative aspect, in this case, is a potential heating of the cup itself. That is why you should be careful not to get burnt while cooking. The volume of Soy Milk Makers may vary, starting from 1.3 liters and up to 2 liters. These limits are sufficient for home appliances. But we remind you that after cooking, soy milk should be separated from okara (insoluble residues), resulting in a decrease of the drinkable fluid by 15 – 20%. The Capacity is the second important criterion for selecting a milk maker. The number of pre-installed functions determines the range of meals that can be cooked. Despite the fact that the main purpose of such devices is producing tasty and healthy soymilk, it also allows you to enjoy diet soups, vegetable purees or freshly-squeezed fruit juice. 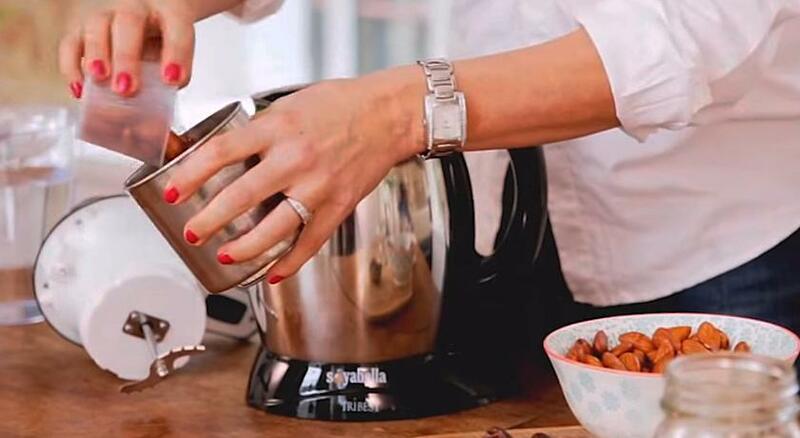 A possibility to finely grind various nuts and even coffee beans can turn a soy milk maker into an indispensable assistant in your kitchen. The capacity of a soy milk maker determines capability of preparing high-quality dishes really fast. The experts believe the optimal power is from 700 W to 1,000 W. The higher it is, the more efficient and even the grinding and heating will be. Speaking of the time required to turn beans into a ready-to-eat meal, it’s from 15 to 30 minutes on average. You will probably agree that everybody would prefer to taste fresh, delicious and fragrant soymilk as soon as possible after the beginning of the cooking process. Finally, another important feature is the Convenience. If a device has a water level control sensor, an overflow sensor, or a thermometer, the cooking process runs fully automatically. 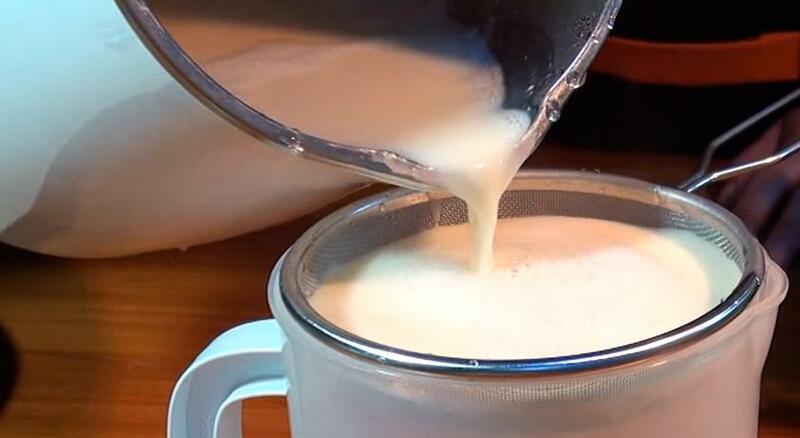 A good Soy Milk Maker can independently prepare milk of the desired thickness and at the pre-set temperature, and cook other delicious meals and drinks in addition. If there is a LED display (showing the cooking progress) and a cup has the level marks, you will be able to control the process better and add the right amount of ingredients to reach the required density of the product. And if soy milk makers come with various measuring cups and containers, you will be able to start using the device immediately after receiving the package. 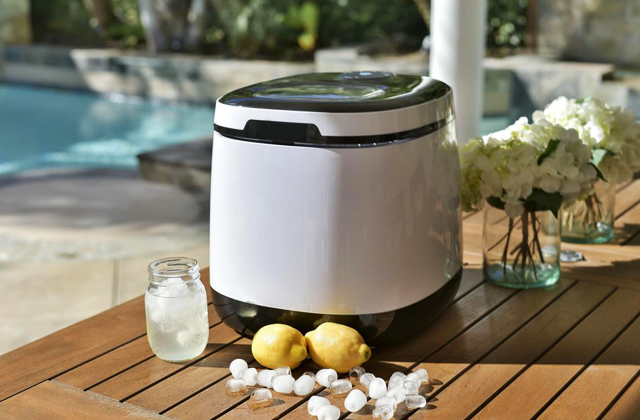 Some models provide an easy-cleaning function, saving you from hand washing of the cup. The set of accessories may also include cleaning wipes and brushes, which save your time and effort. So, the choice is vast and you can pick the model to suit your tastes and preferences the best. Make your menu not only more diverse but also healthier. That's easy with a soy milk maker! 1. Soy Milk Maker, Wikipedia. August 27, 2014. 2. Soybean, Wikipedia. July 25, 2016. 3. Marcelle Pick The Health Benefits of Soy, Women to Women. 4. Maulishree Jhawer Health Benefits of Soybean, Medindia. 5. 6 Health Benefits of Soy Milk/Nutrion/Healthy Eating, Fitday. 6. Sylvie Tremblay Soy Milk Advantages and Disadvantages, LIVESTRONG. January 20, 2014.